I told you that about two weeks ago, Dawson's back legs quit working. He was so pitiful. We got him on steroids and pain meds but he was also very sick and not keeping food down, couldn't go to the bathroom and losing weight. I didn't sleep for three nights in a row because he was up crying most of the night and I slept by him in the living room. Scott and I and the vet were having discussions on if it was time to put him down. The vet called me at the gym one morning and I had to leave because I was crying. Thankfully, he is SO much better. He is not 100% and is still a little wobbly but he's eating like a horse again and getting around pretty well. I have been so thankful. I don't know how much longer he has with us but I'm so thankful he is better for now. This was us pre-kids. 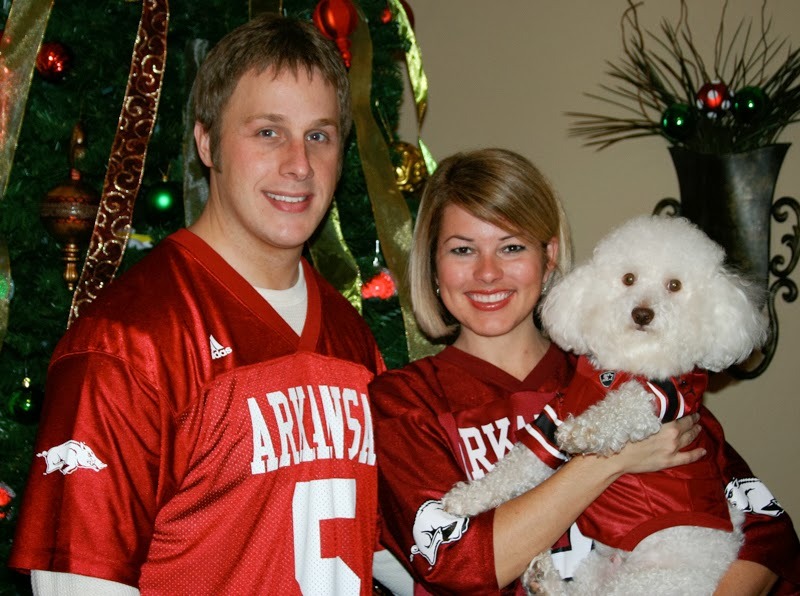 Back when we did things like all 3 of us wearing Arkansas jerseys. Doesn't Dawson look CHAWED? ha! The other night at dinner Harper said she wanted to say a special prayer for Dawson (we call him Dawsy most of the time). Scott filmed it and I'm so glad he did because right at the end of this I was shaking the table I was laughing so hard. Hopefully you can understand her.........at the end she says "that's a potty word." Exactly what you want to hear your sweet little girl say in the middle of her prayers. We are teaching the girls that you can talk to God about anything - big or small. He cares about even the smallest details of our life. I'm glad Harper is learning this truth. Even if she is thanking God that Dawson can go to the bathroom again.